Nothing in the House: Happy National Pie Day! Happy National Pie Day! Though I am in more regular observance of The House of Representatives decreed Pi(e) Day on March 14th (3.14), I'll not turn down a chance to celebrate the little dish that this here space is all about. 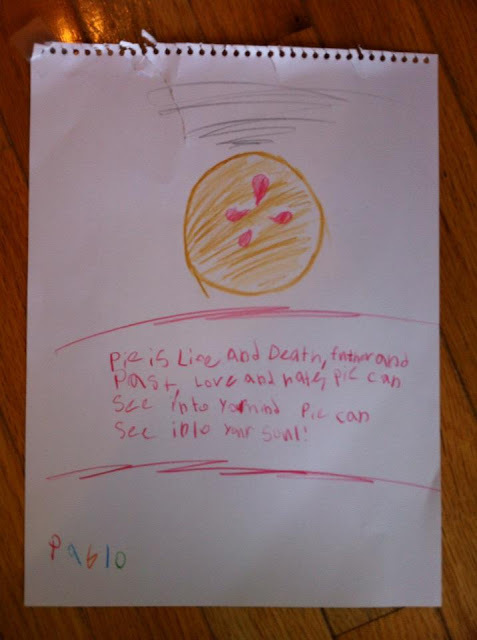 To commemorate the day, here is a illustrated poem by a child name Pablo, who has some SERIOUS thoughts about pie. We knew it was powerful, but little did we know just. how. powerful it can be. Is pie a witch? A wizard? Father Time? Mother Earth? Psychic? God? It seems little Pablo has some special insight into the implications of the dessert-- I have so many questions for him. Thanks to my friends Neale and Clare for sharing this gem. Enjoy some pie today, and remember this while you eat it. Don't get too scared. I celebrate pi day in March with my students. It is fun! Very cool! It's a fun (and delicious) day to celebrate. First pie of the almanac! I made your chocolate ganache and caramel January pie for a group of friends on Pie Day, and now I am absolutely too excited to bake Lemon Shaker for Valentine's Day (and they're to excited to try it!). My brother, a student in DC, bought me your recipe book for Christmas. Well, I can say for certain those delicious recipes and illustrations make up the best gift of the year. Thank you, both, so very much for my new love of baking from scratch! Oh my, thank you so much!!! Elizabeth and I are flattered. So glad you like the almanac and the recipe! And better yet that it's inspired your baking love (teach a gal to fish...). Let me know how the rest of the recipes go and get in touch if you ever have any questions.